Diego Simeone has proven himself to be a true master of organizing the perfect defense. And during Atletico Madrid’s match against Malaga, she demonstrated that sometimes the perfect defense is ordering someone to throw a second ball on the pitch in order to stop a counter attack. The game was still scoreless coming up to half-time, with Malaga looking to counter-attack, but play was stopped by referee Antonio Mateu Lahoz after a second ball entered the playing surface. 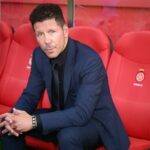 It was not immediately clear who was responsible, but the referee was seen speaking to Simeone as the teams left the pitch at the break, and when the game restarted the Colchoneros coach was seated in the stands. La Liga rules state that the head coach is responsible for the behaviour of the entire bench. With Simeone shouting from the stands during the second half, Atletico went on to score the match’s only goal to keep pace with Barcelona and remain one point ahead of Real Madrid. Sometimes the best defense is a super illegal one.